Warragul Salvation Army Corps was the recipient of a donation of $2,000 from the Drouin Rotary Club as part of its annual distribution of funds to local community groups. 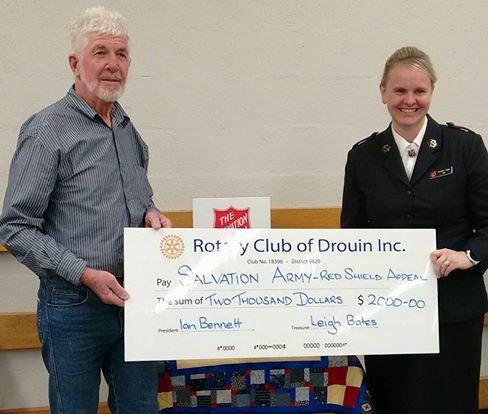 Recently, the Warragul Salvation Army Corps was the recipient of a donation of $2,000 from the Drouin Rotary Club as part of its annual distribution of funds to local community groups. This would be used for the Corps’ welfare program. The cheque was presented to Major Christine Waller, Corps Officer, by Rotary’s Service Projects Director, Kevin Roberts. Kevin said that the Club was pleased to be in a position to assist local groups again this year, in support of their respective programs. He said that another service project completed recently was the construction of a metal covered pergola at the Drouin Primary School, which will provide weather protection for pupils in the vegetable garden area. A timber table for use in potting plants was provided, and 60 metres of piping was installed for watering the plants. In addition to the “hands-on” work, the Club contributed $1,270 towards the total expenditure of $2,270. Also, the Club provides financial assistance for the School’s Thursday morning Breakfast Club. Kevin said that these donations were made possible by the proceeds of this year’s major fund-raising projects, the Motorfest, the Swap Meet and the monthly Drouin markets. (1) Major Christine Waller (right) receiving the cheque from Drouin Rotary Club’s Service Projects Director, Kevin Roberts. 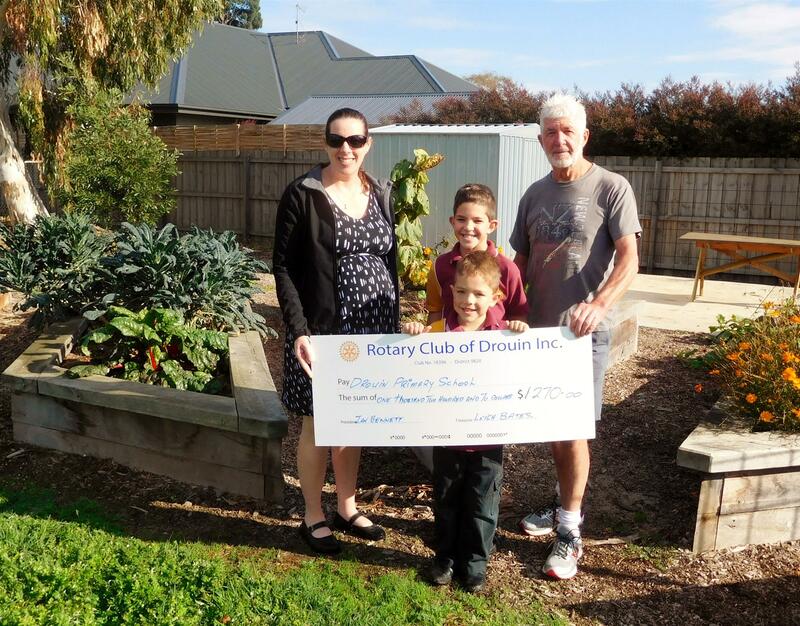 (2) Staff member Janelle Kehayas (left), pupils Jacob (rear) and Billy Atkinson, receiving the cheque from Rotarian Kevin Roberts.